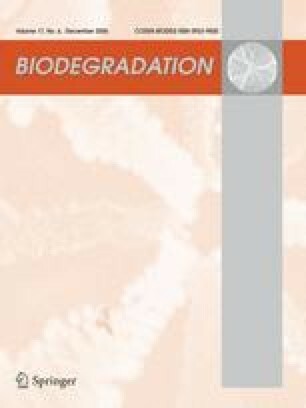 The objective of this study was to achieve a better quantitative understanding of the kinetics of 2,4,6-trichlorophenol (TCP) biodegradation by an acclimated mixed microbial culture. An aerobic mixed microbial culture, obtained from the aeration basin of the wastewater treatment plant, was acclimated in shake flasks utilizing various combinations of 2,4,6-TCP (25–100 mg l−1), phenol (300 mg l−1) and glycerol (2.5 mg l−1) as substrates. Complete primary TCP degradation and a corresponding stoichiometric release of chloride ion were observed by HPLC and IEC analytical techniques, respectively. The acclimated cultures were then used as an inoculum for bench scale experiments in a 4 l stirred-tank reactor (STR) with 2,4,6-TCP as the sole carbon/energy (C/E) source. The phenol acclimated mixed microbial culture consisted of primarily Gram positive and negative rods and was capable of degrading 2,4,6-TCP completely. None of the predicted intermediate compounds were detected by gas chromatography in the cell cytoplasm or supernatant. Based on the disappearance of 2,4,6-TCP, degradation was well modelled by zero-order kinetics which was also consistent with the observed oxygen consumption. Biodegradation rates were compared for four operating conditions including two different initial 2,4,6-TCP concentrations and two different initial biomass concentrations. While the specific rate constant was not dependent on the initial 2,4,6-TCP concentration, it did depend on the initial biomass concentration (X init). A lower biomass concentration gave a much higher zero-order specific degradation rate. This behaviour was attributed to a lower average biomass age or cell retention time (θx) for these cultures. The implications of this investigation are important for determining and predicting the potential risks associated with TCP, its degradation in the natural environment or the engineering implications for ex situ treatment of contaminated ground water or soil. This work was supported by a Strategic Grant from the Natural Science and Engineering Research Council of Canada (NSERC).